All of the products included in the kit have their own unique purpose, but can be broken down into three main categories: contact sprays, residual sprays, and residual powder. The contact sprays work exactly like you’d expect them to: they kill bed bugs on contact. 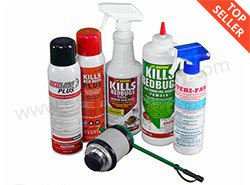 Our professional kit comes with two contact sprays, STERI-FAB and JT Eaton Kills Bed Bugs. STERI-FAB is a fast-acting, alcohol-based killer that’s safe for use on upholstery and many other soft fabrics. JT Eaton uses natural pyrethrin that can kill bed bugs that are resistant to many synthetic compounds. We recommend using STERI-FAB to treat your mattress, box spring, and soft floors like carpet or rugs, and use JT Eaton on your bed frame, baseboards, moldings, and between floorboards if you have hardwood. Contact sprays are great at quickly knocking down the population of an infestation, but they’ll evaporate and become ineffective within a few hours. That means that any surviving bed bugs can continue feeding and reproducing. That’s why we also want to use residual sprays, which kill slower but are effective for several weeks. The professional kit comes with two very popular residual sprays: Bedlam Plus and JT Eaton Kills Bed Bugs Plus. Bedlam Plus is better suited for picture frames, wall hangings, and drapes, while JT Eaton Plus is better for bed frames, upholstered furniture, and floors and baseboards. The kit comes with enough contact and residual sprays for three full treatments: once now, another in two weeks, and then a final treatment two weeks after that. This ensures that all bed bugs, including newly hatched eggs, are killed off. There are some places where you can’t use sprays, like electrical outlets, light switches, and in deep cracks and crevices. That’s where a residual powder comes in. This kit comes with JT Eaton diatomaceous earth powder, as well as a professional powder applicator. With the help of the powder applicator, you can apply powder between baseboards, under appliances, behind the faceplates of light switches and electrical outlets, and in cracks and crevices like in door frames or where the wall meets the floor. Be sure to check out the powder applicator page for a video on how to use it properly. Our professional kits are available in three flavors based on your needs. First, you have the 1-2 room kit, the best choice for small residences. If you need to treat more rooms, you’ll need more spray and powder, so we offer the 3-4 room kit for larger residences. If you’re a professional looking to treat multiple homes, our commercial kit includes enough spray and powder to treat up to eight units. Keep in mind that this kit is intended to be used during step 4 of our professional 4-step solution. Our 4-step solution has been proven over the years to be the best do-it-yourself method out there. As always, make sure to follow the products’ labels and MSDS for safe and effective usage. Our complete bed bug kit includes all the powders and sprays needed to treat your home like a professional throughout the initial treatment as well as 2 follow up treatments.